The nymphs are normally excellent swimmers, but they become much less mobile as they're emerging and dead-drift (Dead-drift: The manner in which a fly drifts on the water when not moving by itself or by the influence of a line. Trout often prefer dead-drifting prey and imitating the dead-drift in tricky currents is a major challenge of fly fishing.) helplessly to the suface. Considering that they then emerge and fly away quickly, this makes the nymphs the prime stage to match during this emergence. These species molt into spinners and mate the same day they emerge. The spinner activity usually comes at dusk, or even after dark. 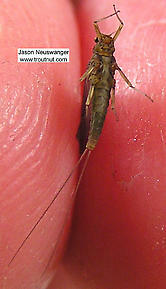 Male Acentrella turbida (Tiny Blue-Winged Olive) Mayfly Spinner View 3 PicturesI would not like to have to match this hatch. These are the smallest mayflies I have ever seen. 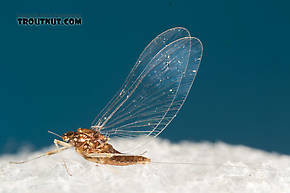 I used to think Caenis was the smallest adult mayfly in the west but these guys are about 4mm long. The male eyes are two toned, brown above and olive below. The abdomen is dark brown interspersed with light brown. The abdomen is clear for the anterior (Anterior: Toward the front of an organism's body. The phrase "anterior to" means "in front of.") 2/3rd and the remainder is white. The tails are twice as long as the insect. There is only one pair of wings. Hi Jason! 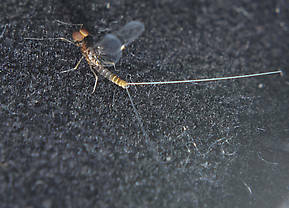 Do you have a picture of the (acentrella-miniature BWO nymph) on the site? I've been fishing them and wanted a better idea of how they look.